Shyama Kumari Rajan’s debut novel “Be the Voice” (published by AuthorHouse UK) tells the tale of an Indian girl’s relentless search for the true meaning of freedom, dignity and happiness and her passion about acquiring knowledge. The book is available for purchase at: https://www.amazon.com/Be-Voice-Shyama-Kumari-Rajan/dp/1546290931. Based on true events, the book narrates story of Kamla, who was born just as India gained its independence, through journey of her life. Wanting to attain a bright future, Kamala dreams of freedom and works hard to become a teacher, even as her friends begin to get married as teenagers. “Be the Voice” is about passing on dreams of a true spirited human life to the next generation who will become the voice of humanity and world peace. Shyama Kumari Rajan was born in Bhagalpur, Bihar, India. She earned a Bachelor of Technology in civil engineering from the Indian Institute of Technology in Kharagpur, India, and a Master of Science in engineering and doctorate from the School of Aeronautics and Astronautics at Purdue University in the United States. Rajan is a passionate aerospace engineer who currently resides in Connecticut. 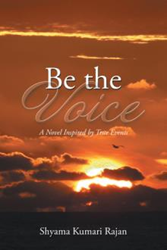 “Be the Voice” is her debut novel. Rajan has previously published technical works under the name Shyama Kumari.